The Invasion of the Kuril Islands (Russian : Курильская десантная операция "Kuril Islands Landing Operation") was the World War II Soviet military operation to capture the Kuril Islands from Japan in 1945. The invasion was part of the Manchurian Strategic Offensive Operation, and was decided on when plans to land on Hokkaido were abandoned. The successful military operations of the Red Army at Mudanjiang and during the Invasion of South Sakhalin created the necessary prerequisites for invasion of the Kuril Islands. The 2nd Far Eastern Front was a Front—a formation equivalent to a Western Army Group—of the Soviet Army. 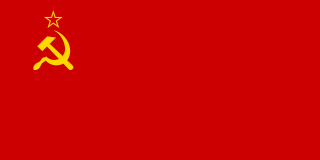 It was formed just prior to the Soviet invasion of Manchuria and was active from August 5, 1945, until October 1, 1945. The 101st Rifle Division was a unit of the Soviet Red Army initially formed as a mountain rifle division on 28 August 1938 within the 2nd Separate Red Banner Army in Petropavlovsk-Kamchatsky city. The 89th Division was an infantry division in the Imperial Japanese Army. Its call sign was the Destruction Division. It was created 28 February 1945 in Sapporo, by cobbling together 43rd and 69th independent mixed brigades, converted to 3rd and 4th mixed brigades, plus headquarters of the 77th division. It was an oversized type C(hei) security division. The Japanese Fifth Area Army was a field army of the Imperial Japanese Army during the closing stages of World War II. It saw combat against the Soviet Union in Japan’s northern territories. The Japanese 27th Army was an army of the Imperial Japanese Army during the final days of World War II. Nemuro is a subprefecture of Hokkaido Prefecture, Japan. Japan claims the southern parts of the disputed Kuril Islands as part of this subprefecture. The Habomai Islands (Russian: Хабомаи, Japanese: 歯舞群島 or 歯舞諸島 are a group of islets in the southernmost Kuril Islands. They are currently under Russian administration, but together with Iturup, Kunashir, and Shikotan are claimed by Japan. Paramushir (Russian: Парамушир, translit. Paramushir, Japanese: 幌筵島, translit. Paramushiru-tō or Horomushiro-tō, Ainu: パラムシㇼ　or パラムシㇽ, translit. Para-mu-sir, is a volcanic island in the northern portion of Kuril Islands chain in the Sea of Okhotsk in the northwest Pacific Ocean. It is separated from Shumshu by the very narrow Second Kuril Strait in the northeast 2.5 km, from Antsiferov by the Luzhin Strait to the southwest, from Atlasov in the northwest by 20 kilometres, and from Onnekotan in the south by the 40 km wide Fourth Kuril Strait. Its northern tip is 39 kilometres from Cape Lopatka at the southern tip of the Kamchatka Peninsula. Its name is derived from the Ainu language, from “broad island” or “populous island”. Severo-Kurilsk, the administrative center of the Severo-Kurilsky district, is the only permanently populated settlement on Paramushir island. A somma volcano is a volcanic caldera that has been partially filled by a new central cone. The name comes from Mount Somma, a stratovolcano in southern Italy with a summit caldera in which the upper cone of Mount Vesuvius has grown. Kiichirō Higuchi was a lieutenant general in the Imperial Japanese Army in World War II. Kuril Ainu, or Kuril, is an extinct and poorly attested Ainu language of the Kuril Islands, now part of Russia. The main inhabited islands were Kunashir, Iturup and Urup in the south, and Shumshu in the north. Other islands either had small populations or were visited for fishing or hunting. There may have been a small mixed Kuril–Itelmen population at the southern tip of the Kamchatka Peninsula. The 355th Rifle Division was a standard Red Army rifle division of World War II, formed twice. The IJA Amphibious Brigades were marines brigades of the Imperial Japanese Army during World War II. They were established in 1943. Although the Japanese invasion of Southeast Asia had been completed at the time of their founding, the Imperial General Headquarters saw the need for flexible countermeasures to defend strategic islands in the Pacific Ocean from impending Allied invasion as the war situation deteriorated for the Japanese Empire. ↑ Glantz, David. August Storm: The Soviet 1945 Strategic Offensive in Manchuria. Portland, Oregon: Frank Cass Publishers. p. 8. 1 2 Glantz, David. August Storm: The Soviet 1945 Strategic Offensive in Manchuria. Portland, Oregon: FRANK CASS PUBLISHERS. pp. 299–300.